Best Mortgage Rates London Ontario | Available 24/7, I offer Mobile Mortgage Broker Services to London Ontario and Surrounding Area. Call or Text 519-860-2102 for Details. As a Licensed Mortgage Agent I have access to the Best Mortgage Rates in Ontario. Available 24/7, Call or Text 519-860-2102. 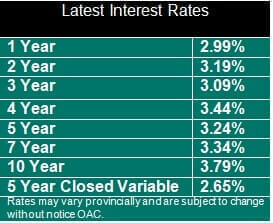 Listed below is a comparison of the Lowest Mortgage Rates in Ontario to which I have access. Mortgage Brokers and Mortgage Agents in the London Ontario and area region have access to much better mortgage rates than those offered by the big banks. The chart below averages the posted and discounted mortgage rates offered by TD, Scotiabank, RBC and CIBC. Their average rate is much lower than those lowest mortgage rates offered by the lenders with which I deal! As shown on the Interest Rate chart, by using a Mortgage Broker or a Mortgage Agent you can expect to save thousands of dollars on your next mortgage. With current mortgage rates on a five-year fixed mortgage term (which is the most common) you will save over $8,000 just for using a Mortgage Broker or a Mortgage Agent. Further, as banks do not generally like locking themselves into longer, 7 or 10 year fixed terms, as demonstrated by the Interest Rate Chart above, you can expect to save even more money.